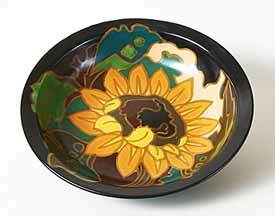 Black Gouda bowl with floral design - 8¾" (222 mm) diameter. Gouda is ten miles north-east of Rotterdam in Holland and famous for two things. Although our descriptive prose is more often described as cheesey than deathless, we'll concentrate on the pottery. Gouda pottery is not necessarily made in Gouda - Gouda is a loose term to describe the style, sometimes called Dutch Delftware. Earthenware products were manufactured in Gouda as early as the beginning of the eighteenth century; the town was famous for its clay pipes. At the end of the nineteenth century the emphasis moved to decorative wares, and for three decades the beautiful art nouveu plates, vases and jugs were made by many factories, most notably, perhaps, PZH or Plateelbakkerij Zuid-Holland. By the start of the 1930s the art deco style was taking over and the global economic climate put an end to the costly production of Gouda wares. A few makers lingered on, but the heyday of Gouda was the first third of the twentieth century. Visit Gouda Design, a very good source of information about Gouda pottery.